After hearing the announcement yesterday regarding the new check-in feature integrated with Ovi Maps, we are now hearing some news around an official Foursquare app for Nokia devices. Although you can check-in on Ovi Maps and send it to specific social networking services, it still doesn't allow you to do it with Foursquare. Things will seemingly change in a matter of a week when the official Foursquare app should be made available for download. Foursqure's VP of mobile and partnerships, Holger Luedorf, announced that the app is being developed in-house by Nokia and will continue to increase their exposure. Looking further down the road already, Luedorf even mentioned that “deeper integration” would come to light with Nokia's own services – so don't be surprised seeing it become integrated with Ovi Maps. The app itself is looking like any of the other ones available on rival platforms like Android and iOS. 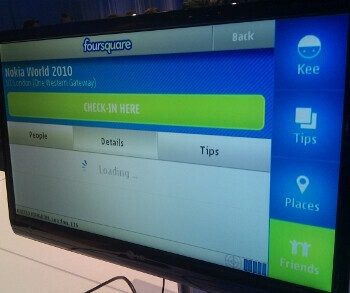 As it stands, the official Foursquare app for Nokia is going to be compatible with Symbian^3, 5.0, and 3.2 handsets. Hope is developed using Qt.